Doudlas and Osbourne : Surf riding at Waikiki, 1901. A short account of surfboard riding with Prince David Kaw'nanakoa at Waikiki in 1901. "Prince David La'amea Kahalepouli Kinoiki Kaw'nanakoa Pi'ikoi (1868–1908), was the patriarch of the House of Kaw'nanakoa. He was in the line of succession to the throne of the Kingdom of Hawai'i around the time of the kingdom's overthrow. In 1885 he was sent by the Hawaiian government to attend Saint Matthew's School, a private Episcopal military school in San Mateo, California. His two brothers would also attend." - wikipedia: David Kaw'nanakoa, viewed 22 April 2013. 1828 August Duhaut-Cilly : Surfing Chiefs at Waikiki. 1846 Chester S. Lyman : Royal Surf Riding at Waikiki. group at which we touched. There are nine of these islands, all difficult of access owing to the absence of harbours, and dangerous rocks. Borotonga, the largest, is nearly thirty miles round. The inhabitants are of Maori origin, like the Tahitians and Samoans. We arrived in the height of the orange season, and proposed to put in here to collect the annual harvest of oranges. Mauke is a very primitive little island, and but seldom visited ; the surf-landing is very difficult, and very frequently whole boat-loads of oranges coming out to the steamer are upset. As we were going to be here for some considerable time we landed. There is no proper passage through the reef, so you have to row over it on the top of a wave. The proverbial oldest inhabitant was standing up to his waist in the water on the reef to tell us which wave to go in on, as on some of these islands you land with the third wave, on others with the fifth, and so on, and none but the natives know which particular wave to choose ; but if you don't get the right one you are pretty certain to be overhauled and swamped by the next succeeding one. Prince David was anxious that we should see something of old native customs, which were fast dying out, and so told us he would arrange a true native hula for us before we left. Waikiki Beach, where his house was, is the headquarters for that glorious sport ''surf-bathing" and and great fun it is. breakers, and so get thrown up on the beach. It requires a good deal of skill to remain on the board ; so the girls generally take a man to look after them. Sunday is a great day for this amusement, and we saw it more than once in full swing. Geoff Cater (2013) : Hall and Osbourne : Surf Riding at Waikiki, 1901.
by W. Wyatt Gill ... With sixteen illustrations. 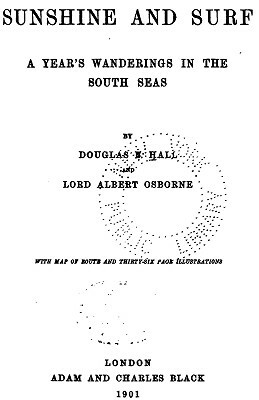 Published 1885 by The Religious Tract Society in [London] .